The force is with Los Angeles as the Lucas Museum for Narrative Art moves one step closer to making a $1.5 billion dream a reality. The City Council voted unanimously to approve an environmental study allowing the museum’s construction to begin. 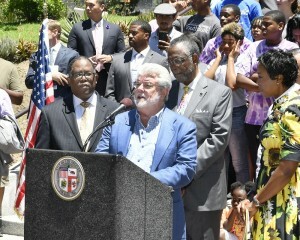 Los Angeles County Board of Supervisors Chairman Mark Ridley-Thomas joined city leaders and young children from the EXPO Center on the on the steps of City Hall to greet George Lucas and his wife Mellody Hobson. 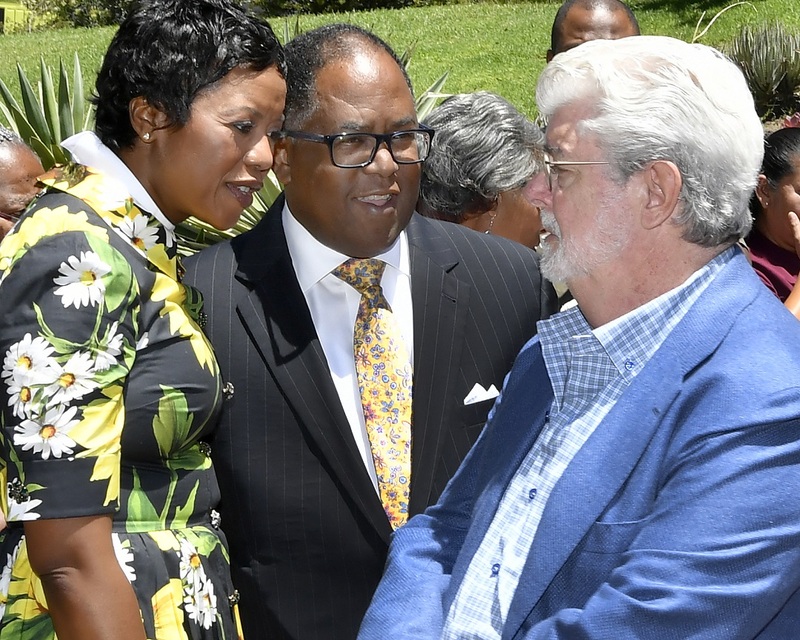 “The Lucas Museum of Narrative Art is a natural addition to the Exposition Park, the historical center of education, culture and sports for Los Angeles County,” said Chairman Ridley-Thomas. The Lucas Museum of Narrative Art will be a one-of-a-kind gathering place to experience art and exhibitions dedicated to the power of storytelling across all media, including paintings, illustrations and moving images. The Lucas family will fully fund the Museum’s $1.2 billion construction, collection, and operating endowment with no cost to taxpayers to build the Museum. 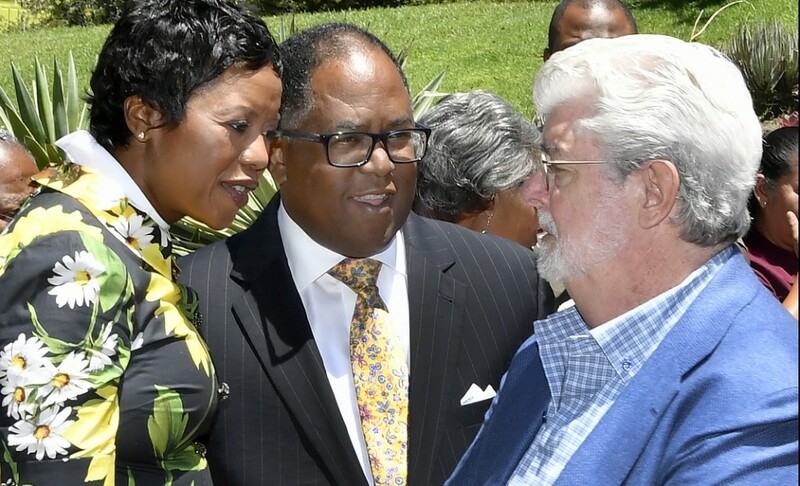 “The goal of the museum is to inspire people to think outside of the box and help build on the myths that hold our communities together,” said George Lucas. The new museum is expected to create more than 3,660 construction-related jobs and more than 400 full-time jobs related to the operation of the Museum. The construction jobs will pay family-supporting wages for local residents due to the Project Labor Agreement with the construction unions. The Museum will be located in Exposition Park along Vermont Boulevard bordering Martin Luther King, Jr. Boulevard and Jessie Brewer Park transforming 11 acres of asphalt into public green park and garden space with the Museum hovering above. 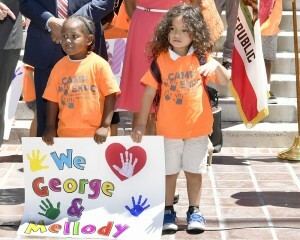 The Museum will be located in the heart of the South Los Angeles surrounded by more than 100 K-12 schools. The Museum will feature public lectures and classes for all ages, hands-on workshops, after-school programs and camps, and a wide variety of additional educational opportunities. Acting on a motion by Supervisor Ridley-Thomas, the Los Angeles County Board of Supervisors unanimously voted last November to issue a resolution declaring Exposition Park as the ideal location for the Lucas Museum. The Museum is expected to break ground as early as this year and open its doors in 2021.